The investigation described in this book aims at bringing knowledge to issues involving the joint use of self-* properties and P2P to contribute with the development of Self-* P2P alternative for designing network management solutions. The methodology of the investigations is based on the definition of management requirements, integration requirements for the joint use of self-* properties and P2P, as well as the identification and development of two case studies. 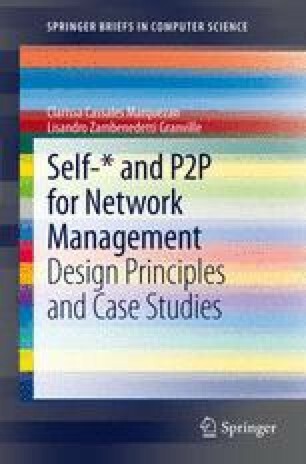 We conclude that the principles of the Self-* P2P design applied to the first case study (self-healing P2P solution) breaks the traditional paradigms of using Management by Delegation on top of P2P infrastructures for network management. The designed solution enables the use of P2P application capabilities in order to enable a fully distributed and cooperative autonomous management approach. Embracing this break through, the design of the second case study (self-organizing P2P solution) gives a step further on the development of Self-*P2P solutions by exploring P2P application capabilities for the design of self-* properties applied to network management. Following the Self-* P2P design principles, one can development truly distributed and cooperative network management solutions, in which the presence of the humans is minimized and the managers are embedded inside the managed elements.